In a time filled with dark atonal techno, Peter Dundov tries to offer something different. His latest offering on Music Man Records, entitled Sailing Off The Grid, is filled with slow burning synth lines and bursts of melodic treasures. It is an ambitious album, and one that could certainly hold strong during one of his extended sets at Japan’s acclaimed Labyrinth festival. With over half of the tracks breaching the 9-minute mark, it is easy to see that Dundov isn’t aiming for a quick fix, but rather an immersive and engaging listen. The album begins by giving a nod to early synth music and minimalism with “Enter The Vortex”. Rhythmically the track is carried by a single pulsing bass note, while short percussive stabs and sustained major chords ring about in glorious harmony that could only depict something as epic as the opening of heaven’s gates. From here he progresses with a few dance floor burners such as “Yesterday Is Tomorrow” and “Moving”, the latter of which being one of the obvious standouts with its heartstring-pulling melody and infectious groove. The pace then slows with “Spheres” - a track that could almost serve as the backdrop for an 80’s drama due to its punchy, reverb-drenched snares and slow, melancholy synthwork. “White Spring” and the title track, “Sailing Off The Grid”, dive deeper into Dundov’s seemingly never ending synth tones – both focusing on a slow groove and building up in an almost jam-band like manner. There is a refreshingly live feel to the tracks, and while the instrumentation remains stagnant Dundov does a fairly good job at keeping things interesting. “Sur La Mer Avec Mon Ami” once again takes the mood into a more ambient realm with tones that breath and shimmer and a crisp percussive background keeping things together with an almost latin flair. The album then closes with the mantra of “Cradle”, in which 4 notes gently rock back and forth while more synths sing above, providing a peaceful ending to the album. 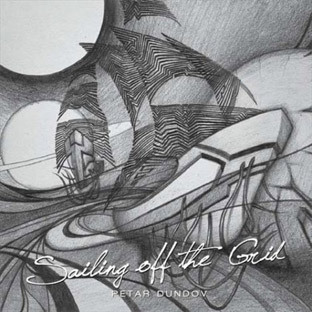 Although it is not too far of a departure from his earlier efforts, Sailing Off The Grid is a well thought-out and well produced album that has some genuinely good moments. It would be nice to hear Dundov expand his sound palate a bit, but nevertheless he shows a true mastery over his instruments and manages to really make them come alive throughout the duration of the album.